While watching a sports match is often a lot of fun by itself, a game always matter more when there is money on it. Sports betting is a huge part of the fun, entertainment and interaction provided by the big sports and if you are looking to enjoy the best standard of basketball betting, SportsBetting is a site to trust.The site provides a great range of NBA and NCAAB betting options and there are also future markets for domestic basketball leagues in Europe. With mobile betting and in-game betting options available on the key basketball matches, you never need to miss a moment of action or excitement.With an easy to use site, a range of deposit options and a good welcome bonus, you’ll find that SportsBetting offers something for every basketball fan, and this is a sports betting site that should be part of your portfolio. 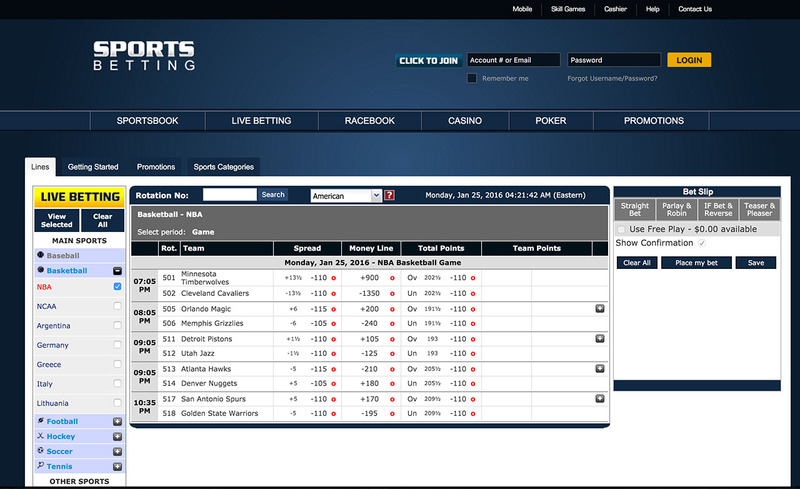 When it comes to sports betting, you won’t find a better brand name than SportsBetting. It says exactly what you are looking for and it is inevitable that many people will stumble upon the site by the name alone. This is a good starting point for the site but of course, as quickly as people stumble upon sites, they can move away just as quickly. With respect to sports betting, SportsBetting offers 5 main sports and 11 other sports, in addition to a range of prop bets. This is obviously a smaller range of sports than some sports book provides but given that the main sports of basketball, football, hockey, soccer and tennis are the sports that most people want to bet on, you have to say that this is more than enough. It may be good to have a range of wild and wonderful sports to add to a coupon every so often but for the majority of people placing a sports bet, the focus falls on the key sports and this is what SportsBetting focuses on. One of the most pleasing aspects of the SportsBetting range of betting options will come with the Future markets. This includes a number of domestic leagues across Europe, which you don’t always find available on sports betting sites, especially sportsbooks aimed at the US market. If you are looking to find a sportsbook that takes basketball seriously and provides an extensive range of betting options, SportsBetting has to be worth your time and consideration. With particular focus on the NBA and NCAAB betting options, if you need to add a serious basketball site to your betting portfolio, you’ll find that SportsBetting has what you are looking for. 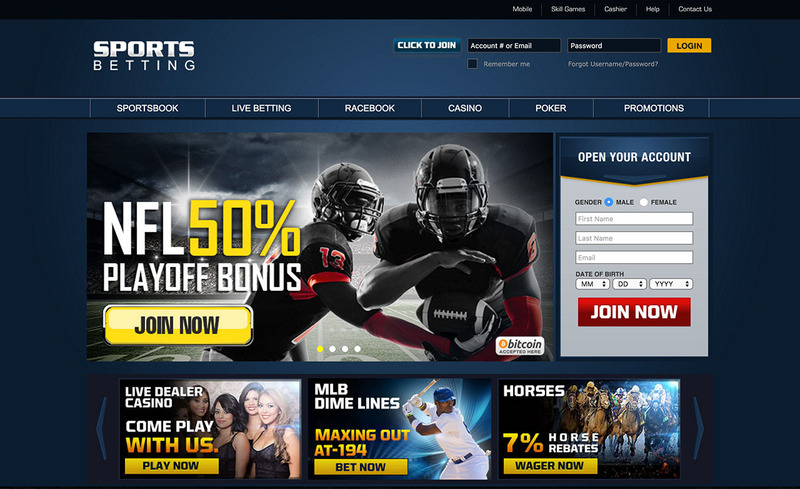 New players to SportsBetting receive a 50% welcome bonus upon making their first deposit. Using the promotional code of “SB50” at the cashier allows players to gain a 50% bonus up to the value of $500. There is also a chance for players to earn an additional 25% bonus for all deposits made on site. Using the promotional code of “FORLIFE” when making a qualifying deposit, players can earn a bonus up to $1,000 which will be placed directly into their account. SportsBetting offers a range of in-play options and there is a chance for players to try out the Live In-Game betting app with an offer that provides a $25 free bet if the first bet with the app is not a winner. This means that making your first In-Game bet is risk-free, which is always going to be an appealing option to gamblers. SportsBetting also provides a mobile option and players looking to try out this mobile option will find that they have an incentive to make their first bet. If the first bet from the mobile app loses, you receive a free bet worth up to $50. There is a prominent CLICK TO JOIN button at the top of the SportsBetting site on every page, next to the login section of the site, and it is a simple process to create an account. There is also a large box on the home page where you can fill in a minimal amount of details about yourself to set up an account with a minimum of fuss and effort. To make the most of any sportsbook, you need to deposit funds and SportsBetting makes it easy for players to place money into their accounts. There are a number of deposit options available to choose from, which should ensure that most sports betting fans can get involved with the site quickly and easily. SportsBetting has a name that will make people take notice but it provides a simple and effective way to bet. If you are focused on the key sports, you’ll find that the range of sports covered, the mobile betting options and In-Game features will give you what you are looking for from a sports betting site.